President Trump has not made his frustrations with Jeff Bezos secret. He's tweeted disparagingly about Amazon more than 10 times since 2015. He continued the trend on Thursday morning with a new twist: A derisive shot at the largest independent agency of the federal government. Trump uses capitalization for emphasis and often for insults, so the question is raised: Is Trump using the term "Delivery Boy" as an insult when delivering things is, by definition, the agency's core mission? In the age of online shopping, USPS plays a vital role in delivering packages for online retail giants like Amazon. Trump has tweeted his misunderstandings about USPS and its operations before. One of Trump's anti-Amazon tweets in December asked why USPS wasn't charging more for package delivery and said Amazon is "ripping off" the Postal Service. USPS spokesman David Partenheimer responded to criticism of USPS and the relationship between USPS and Amazon in January. Partenheimer's op-ed in The Hill refuted criticism of the agency, noting the agency's impact on everyday Americans' lives. We recognize that we are an important part of America’s infrastructure, with obligations to be financially responsible, to remain competitive and to serve the needs of our customers… Our pricing strategies support our infrastructure and ensure that customers have access to reliable, universally available and affordable delivery options. These strategies are applied fairly and reasonably and reflect the needs of the public and the marketplace. To suggest otherwise is a detriment to the reader and the consumer. As my colleague Eric Katz noted in December, Trump seemingly misread USPS financials and the relationship between pricing and USPS' revenue. 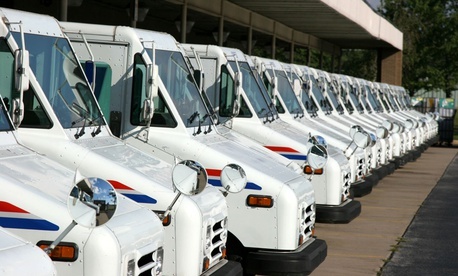 Logistic experts Steve Banker echoed this view in December, in writing that the USPS/Amazon relationship is a fruitful one for USPS and an important one for any business model because of the "last mile" concept. After Trump's December tweet, Banker wrote in Forbes that USPS is a key component of Amazon's business plan because of its zone shipping system that is a big part of Amazon's "network and supporting logistics capabilities." While not referencing Amazon, USPS released an ad in 2017 stating that the agency makes "more e-commerce deliveries than anyone else in the country." The ad highlighted the symbiotic relationship between online commerce and USPS. Through its Amazon Web Services business, the company has numerous contracts with the federal government, including a $1 billion cloud services contract with the Pentagon through a partnership with Virginia-based REAN Cloud. Trump's tweet, according to reports, knocked Amazon's stock price down in Thursday trading.